The content of this article provides interesting history, facts and information about Roman Centurion. Read about the role and position of this officer in the Roman Army and the clothing he wore and the weapons he bore. The Roman centurion was equivalent to a Captain in the Roman Army. The Roman Centurion was often of the humblest origin; he had been promoted from the ranks simply on account of bravery and military efficiency. At the drill, on the march, and in battle, they were at the same time the role models and the leaders of the soldiers. The Roman centurion was a skilled professional who could be relied on to run a legion on campaign and in battle. Each centuria (century) had a centurion and eventually, following the army restructure by the Roman general Gaius Marius (157 BC–January 13, 86 BC) there were 60 centurions in a legion. A centuria was commanded by a centurion and consisted of 100 Roman soldiers. Centuriae were grouped by pairs forming maniples, which were then grouped in cohorts. Each Roman centurion had the option to appoint a second-in-command known as 'optios' - Optio literally means 'chosen one'. Other junior officers reporting directly to the centurion was standard bearer and signifier for each century'. Further advancement to the position of praefectus castrorum, third in command of a whole legion, was possible which would result in a wealthy retirement. The Roman Centurion was distinguished by their dress from the common soldier. 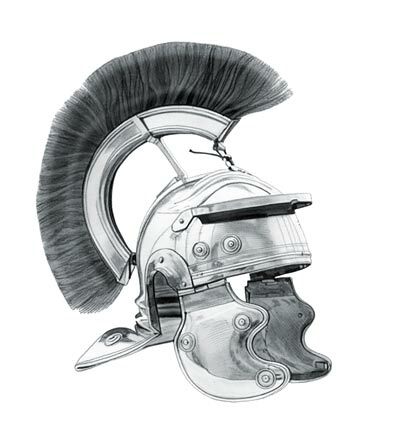 The silver plated helmet of the Centurion was surmounted by a crest which was often made of horse-hair or feathers, and so made as to give an imposing look with the illusion of height that helped him to appear more commanding. The feathers included those from exotic birds including the ostrich or peacock. The centurion wore a transverse crest, meaning that it ran from side to side across his helmet. It is believed that the centurion wore this type of crest in battle during the early Empire to serve as a visual reference and rallying point for their men. The Roman Centurion wore the same basic style of clothes as the Roman Soldiers Clothing, although he had more heavily decorated silvered armor. They wore mail (lorica hamata) or scale armor (lorica squamata), generally about waist length with a curved lower edge in imitation of the bronze muscled cuirass worn by the Roman Tribunes. Their Cuirass, or breastplate was defensive armor for the torso, worn over a cloth, leather, or padded vest. The lower edge of the cuirass was curved and had one or more rows of round or long tongue-shaped lappets (pteryges) which formed a skirt. The Roman Centurion also wore ornate greaves on the front of the leg from the ankle to above the knee which were attached by straps and buckles. The centurion generally wore his ornate sword on the left and dagger on the right, the reverse of the common legionaries. The Roman Centurion also carried the vitis or vine staff which was a swagger stick about three feet in length originally made of grape vine. Their cloaks were typically pinned or fixed to the right shoulder, so as not to impede the movement of the right arm, with a clasp or brooch, called a fibula. The content of this Roman Centurion category in Ancient Rome provides free educational details, facts and information for reference and research for schools, colleges and homework. Refer to the Colosseum Sitemap for a comprehensive search on interesting different categories containing the history, facts and information about Ancient Rome.